icecream4adream | Never Stop Dreaming. 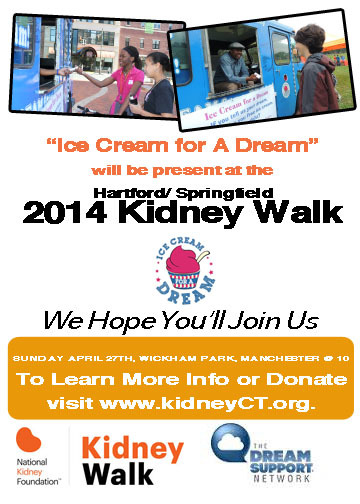 On Sunday, April 27, The Dream Support Network will be present at the 2014 Hartford/Springfield Kidney Walk in Wickham Park to support the cause in more than one way. The event raises awareness and funds lifesaving programs that educate and support patients, their families and those at risk of chronic kidney disease. The walk begins at 10:30 a.m. You can register online at KidneyCT.org. During the Kidney Walk, participants will have the chance to share their dreams for free ice cream treats at the Dream Support Network’s signature “Ice Cream for A Dream” truck. Founder of the Dream Support Network, Abdul Rahmaan-I Muhammad will facilitate the truck and also publically share his personal experience with chronic kidney disease. The purpose of the organization is to motivate communities and individuals to first develop, then follow their dreams, and never stop dreaming. The Dream Support Network is proud to support the National Kidney Foundation for this event. All proceeds of the 2014 Hartford/Springfield Kidney Walk will go to the National Kidney Foundation serving Connecticut and Western Massachusetts. The event begins at 10:30 a.m. on Sunday, April 27th 2014 at Wickham Park in Manchester. Participants can learn more at KidneyCT.org. NEW HAVEN, CT – It’s a concept often overlooked and certainly underestimated; the difference between existing and actually living, and if you haven’t grasped it yet, you may not have experienced the power of your dreams. On Saturday, February 15th The Yale African American Affinity Group (YAAA) is debuting “Powered By Dreams” in their 2014 film festival. The four-day event is dedicated to highlighting the contributions of African Americans in films. The journey of Dream Chaser no. 1 reflects the road every dream chaser endures when they are powered by dreams. 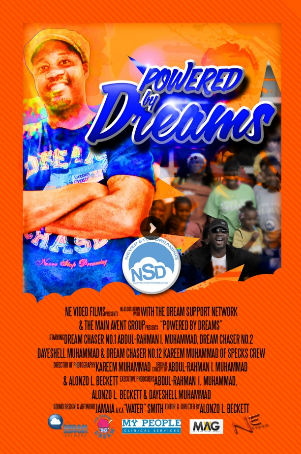 This film documents the founder of the Dream Support Network (DSN), Abdul Rahmaan-I. Muhammad’s steps to recovery after a near-death experience which leads to self-discovery and the conscious decision to live life without fear or limitations. He uses his gift of life to inspire others through the development of his foundation. His commitment to “12 for 12”, a challenge in which you accomplish twelve dreams in twelve months is shown in his travels around the world. From sky diving, to sumo wrestling, starting the “dreamorship” scholarship grant and then purchasing an ice cream truck for the inception of a first of its kind campaign, he continues to make dreams come true. The hours for the Yale African American 2014 Film Festival are from 6 p.m. on Thursday February 13th to 8 p.m. on Sunday February 16th at the Whitney Humanities Center, New Haven, CT. Admission is free. To learn more about “Powered By Dreams” and The Dream Support Network, please visit www. TheDreamSupportNetwork.com. The Dream Support Network’s signature “Ice Cream for A Dream” event will be present at the 10th Annual Big Y Kids Fair. During the fun-filled weekend, the Connecticut Convention Center will be completely transformed into a child’s dream come true. Attendants will have the opportunity to ride a pony , go bungee jumping, participate in a magic show, and of course the chance to share their dreams for free ice cream at the signature “Ice Cream for A Dream” truck. This indoor fair includes a petting zoo, pony rides, video games, bungee jumping, slot car racing and an unlimited variety of entertainment for the whole family. The Dream Support Network’s mission is to give away twenty thousand ice creams for dreams this year. Come visit the pop-up-shop, the newest addition to Ice Cream for A Dream to help reach the goal and most importantly, your dreams. The hours for the Big Y Kids Fair are from 10 a.m. to 5 p.m. on Saturday February 1sth and 10 a.m. to 4 p.m. on Sunday February 2nd at the Connecticut Convention Center, Downtown Hartford, CT. Admission fees are $5 for Kids ;$10 for adults. To learn more about the “Ice Cream for A Dream” tour and The Dream Support Network, please visit www. TheDreamSupportNetwork.com. Frantically running with change jingling in your pockets, out of breath yet still chasing, you were determined to catch the ice cream truck. Whether it was a King Cone for yourself or a Strawberry Shortcake for a friend, we all remember that moment when the tune traveled down your street and up the block. In the summer of 2013, The Dream Support Network switched things up and brought the ice cream truck to you in hopes that you would chase something more dynamic, your dreams. Starting as a joke around the office, to becoming a signature event for The Dream Support Network, Ice Cream for A Dream has made it’s mark and the mission will continue in this new year. On this last day of the year we replaced our dreaming caps with thinking caps to reflect on the Best of Ice Cream for A Dream 2013 moments. What were your best moments of 2013 ? Let us know on Twitter @IceCream4ADream or Facebook. HARTFORD, CT – On Tuesday, January 7, 2014 not only will Bulkeley High School students be returning to a new semester; they will also have the opportunity to share their dreams for ice cream. Ice Cream for a Dream is a powerful community initiative sponsored by The Dream Support Network in which they give anyone who is willing to share his or her dream free ice cream. This sweet motivational tool was created to spark individuals and communities to dream more, dream bigger and actually go out and chase their dreams. In 2013, Ice Cream for A Dream made over forty stops at schools, events and organizations, giving away over 5,000 free ice cream and inspiring individuals to chase their dreams from Hartford, CT to Puerto Plata, Dominican Republic. The dream for the 2014 Ice Cream for a Dream tour is to give away over 20,000 ice creams and hear 20,000 dreams. Bulkeley High School will be the first stop on the tour, stay tuned for the next stop in the 2014 Ice Cream for A Dream tour. 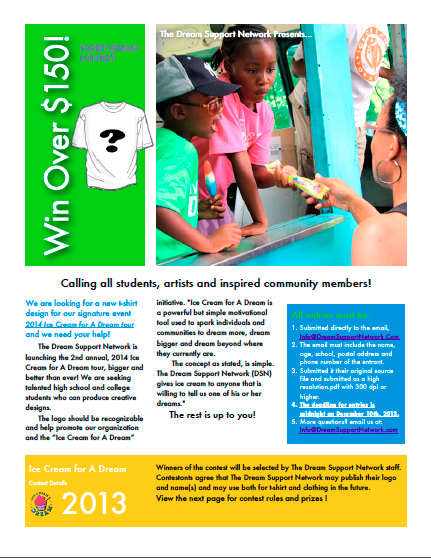 To learn more about the 2014 Ice Cream for A Dream Tour and everything else The Dream Support Network is doing, please visit our website at www. TheDreamSupportNetwork.com. Ice Cream for a Dream-Makes sharing your dream sweet. 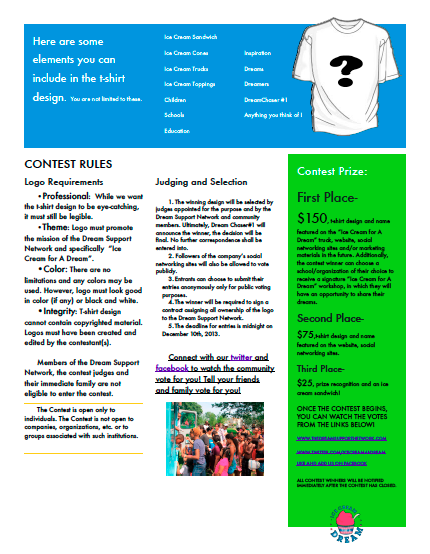 The official Ice Cream for A Dream T-Shirt Design Contest, Enter for a chance to win money prize and more! Follow Us on Twitter @IceCream4ADream or like our facebook page to get contest updates! 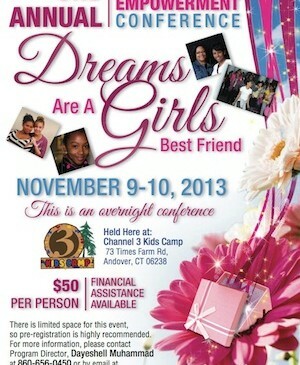 HARTFORD, CT – On Saturday, November 9th 2013, My People Clinical Services (MPCS), in collaboration with the Dream Support Network, will be presenting the 3rd Annual Female Empowerment Conference. During the overnight retreat at the Channel 3 Kids Camp, participants will attend empowering workshops dealing with relationships, self-image, education and healthcare. The young women in attendance will have the opportunity to have mini-makeovers, photo shoots, team building activities, and of course the chance to share their dreams for free ice cream at the signature “Ice Cream for A Dream” truck. 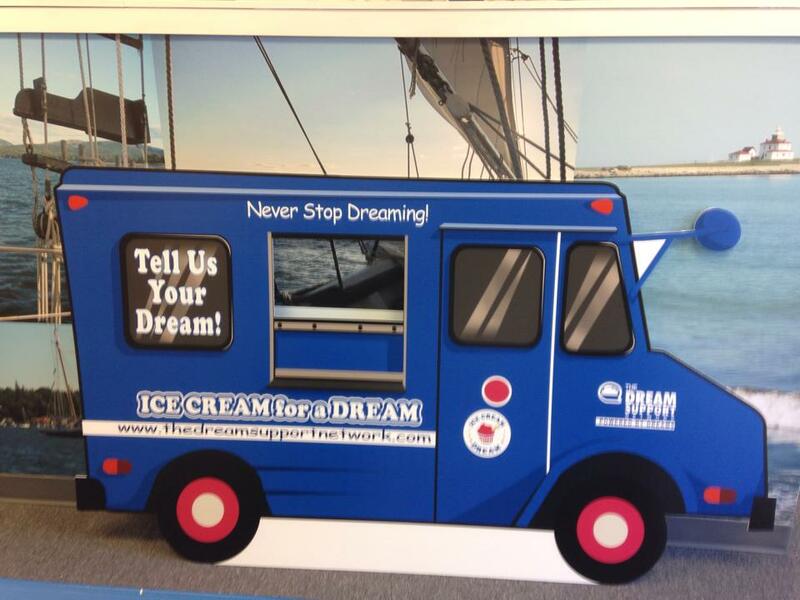 The Dream Support Network’s signature “Ice Cream for A Dream” truck has made over forty stops, giving out free ice cream and inspiring dreamers from all over CT and internationally during it’s 2013 tour. The truck may be going into hibernation after the 3rd Female Empowerment conference but will be returning in 2014 with some exciting changes and an even bigger tour.